Figure 1. Protein sample collection of cress seed endosperm caps and radicles at physiologically defined time points during germination. (A) A germinating cress seed in the stage of testa rupture (the brownish testa has split, revealing the endosperm cap still covering the radicle) is shown next to two Arabidopsis seeds for size comparison. For dissection, the bit of testa attached to the cap is carefully removed and the radicle with the cap cut off at the place indicated with a red line. The radicle is then carefully removed from the cap with a dissection needle, yielding isolated radicles and caps as shown in the lower panel. (B) The cress endosperm weakens during the germination process. Cress endosperm rupture and endosperm weakening are inhibited by abscisic acid (ABA). 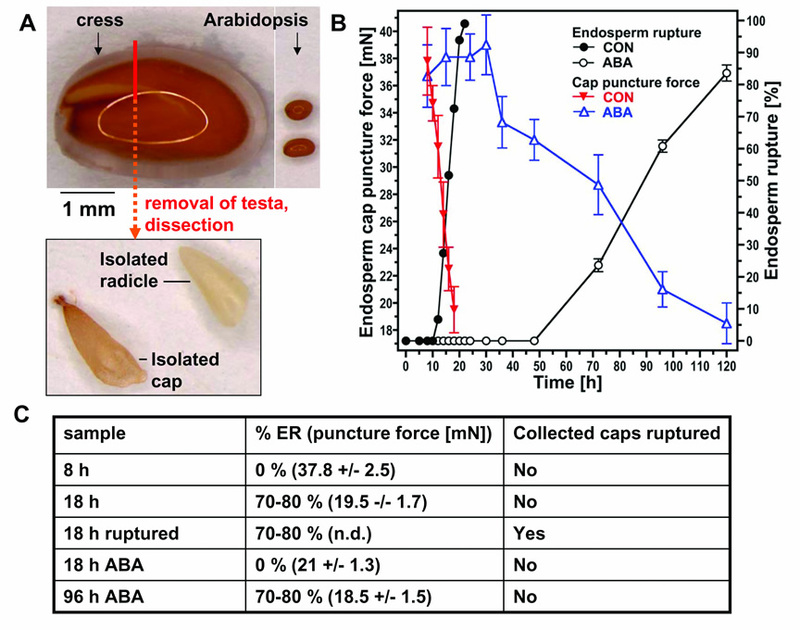 The tissue resistance of the endosperm was measured biomechanically as puncture force in the absence (CON; control) and presence of 10 mM ABA. (C) List of the protein samples used for this work. For each sample, average endosperm rupture at the point of collection and tissue resistance of the endosperm (puncture force, from (B)) are listed. n.d. = not determinable, ER = endosperm rupture.